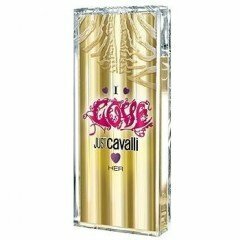 Just Cavalli I Love Her is a perfume by Roberto Cavalli for women and was released in 2010. The scent is fruity-floral. The production was apparently discontinued. MMM... this is GOOOOd i like it very much , sligtly spicy vanilla whit cedar and tonka beens . A warm comfortable sensuel treat..
i tiny wiff of citrus.. this is a orintal vanilla to my nose. maybe slighly more oriental the vanilla but nevertheless ..
this holdes the notes all the way thrue on my skin..
this is a Winterfragranse for shure , The picture that pops up in my headd wearying this is infront off the fire whit a cup of warm apple cider or tea. a twist off cinamon and apple. it is not listed and it does not smell like that exactly, but it makes me think off it.. a christmas perfume maybe..
Write the first Review for Just Cavalli I Love Her!